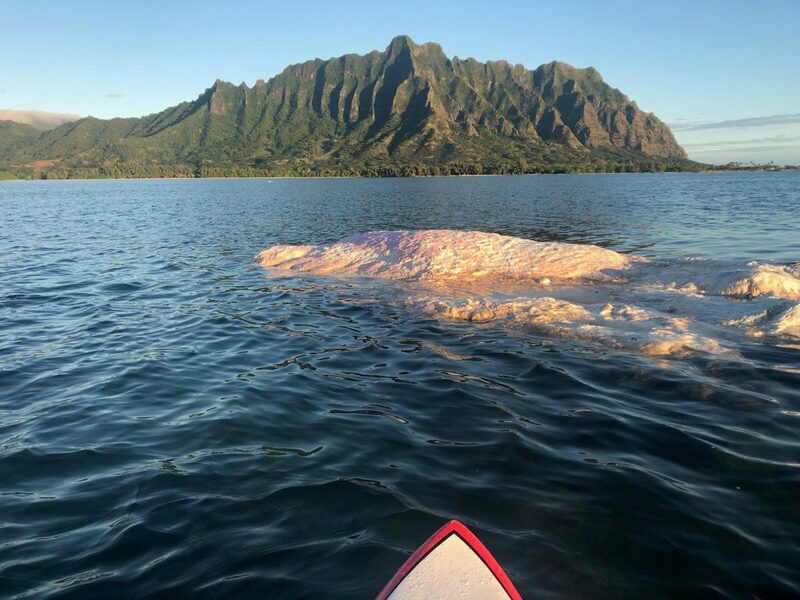 (Honolulu) – Experts from state and federal agencies have agreed that the best option for a whale carcass found stuck on a reef in Kaneohe Bay on Tuesday, is to leave it where it’s at for now. The large and badly decomposed whale carcass is on a patch reef in the northern part of the bay, about a mile off shore. It appears at this time that winds and waves will not bring it into land. The DLNR Divisions of Aquatic Resources (DAR) and Conservation and Resources Enforcement (DOCARE), representatives from NOAA Fisheries and from the University of Hawai‘i Marine Mammal Stranding Team considered numerous options for the disposition of the carcass. Given the difficulties and challenges involved in extracting it from the shallow waters of the reef, the current plan of action is to leave the carcass in place and monitor it daily. If the carcass begins to break apart and move toward shore, the agencies involved will reassess plans and adjust them accordingly. Hawaiian cultural practitioners who’ve been consulted about the carcass indicate they favor the stay-in-place option. DLNR continues to advise boaters and other ocean users to stay well away from the carcass due to the possible presence of sharks feeding on it.